Alpaca-Brats Farm is an alpaca farm located in Northwood, New Hampshire owned by Dawn M. Tonkin. 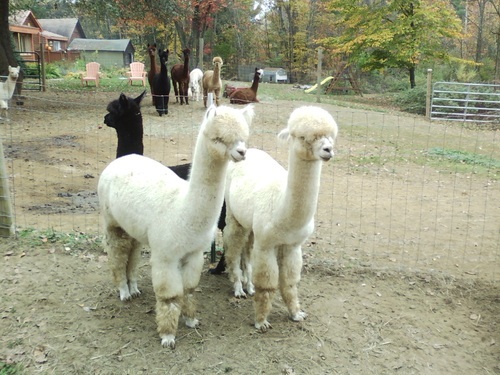 A full service Alpaca farm set in the rural area of Northwood, NH just above the Narrows. Come for a visit and enjoy the Alpacas and the gardens and learn about the Alpaca life style. 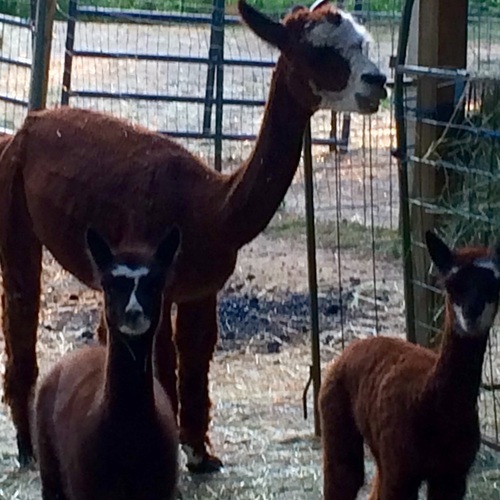 We are a hands on multi service farm offering Alpaca sales, boarding, breeding and farm mentoring. We also sell exquisite alpaca yarn and many different fiber creations to include; Alpaca Blend "Snow Caps." felted Pins and Barrettes, felting kits, alpaca gloves, socks and the most incredibly warm and comfortable alpaca lined inner soles. Various Fiber arts classes available individual or Group contact us to schedule your event. 2016 our newest crisis! Macie May & Aruro's "Boots"
Alpaca-Brats Farm prides it self on having healthy quality animals with fleeces ranging from good to superior. We are dedicated to educating people about this wonderfully gentle, peaceful and cuddly soft animal. There are two types of Alpacas: Huacaya and Suri's. The difference is in the fleeces. Here at Alpaca-Brats Farm we raise Huacaya. Although on the small scale compared to some farms (eleven females and six males) we take pride in our herd of exceptionally well cared for healthy animals with a wide range of colors and quality fleeces. 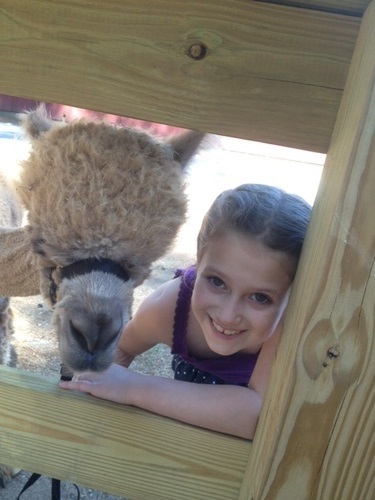 Alpacas are herd animals and in the animal kingdom considered a "prey animal." The fencing we use to keep them safe is more to keep predators out then the alpaca in. They are most often very content in their pastures and it is rare that they would try to jump a fence, unless you have an unruly male who wants to come visit the ladies :) Because they are herd animals they need a partner but do best in a small herd or community. They are easy to care for needing grain, hay and water twice daily in the winter months and less hay in the summer if they have some pastures to graze. They are soft on the carbon foot print so they do very little damage to the pastures. They are also communal "poopers," typically going in one or two piles making clean up easy. Baby alpaca are called Crias and there is nothing better than watching a couple crias frolicking about and bringing shear joy and pleasure. Fleece is the natural fiber harvested from an alpaca. There are 22 natural colors of alpaca fleece. It is light or heavy in weight, depending on how it is spun. It is a soft, durable, luxurious and silky natural fiber. While similar to sheep’s wool, it is warmer, not prickly, and has no lanolin, which makes it hypoallergenic. Alpaca is naturally water-repellent and difficult to ignite. Huacaya, an alpaca that grows soft spongy fiber, has natural crimp, thus making a naturally elastic yarn well-suited for knitting. Come visit us. See, touch and enjoy the pleasure of the alpacas. 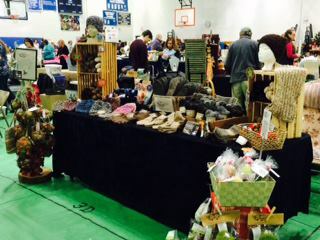 We have many alpaca products, yarns, socks, glove, nesting balls and more. Call for a tour and visit our events page for products or call me and I will do a personal order just for you. We also offer demonstrations on animal husbandry, processing the fleece, fiber arts instruction and or cours sales of our beautiful animals. We will work with you to help you discover the Alpaca Dream. Easy and affordable financiang available upon request. We have animals for hobby/pet farms, breeding females, crias and herd sires.